There are books that I think I’m just not smart enough to read, and this is one of them. I tried to read this one, I really did, but I found myself reading a few pages and having no idea what i just read. And then I’d flip back, read it again, kind of get it but not really, and then continue reading only to discover I had no idea what I just read again. This became a tedious way to read, and I didn’t make it the entire way through the book. I gotta admit that politics aren’t my thing. I have an opinion but it’s such an inflammatory topic that I dread the endless debates and mudslinging that accompanies any political issue. 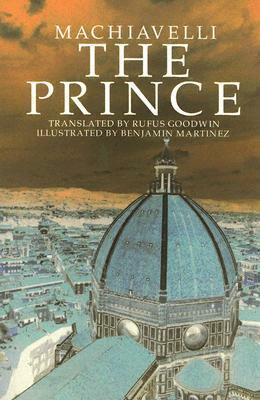 The Prince is a political book of theory, discussing how a “Prince” can maintain his kingdom, based on several factors. I’d explain more but this is kind of where I got lost. Even with the little understanding I had of this book, I can see a modern application of Macchiavelli’s principles in corporate business. About ten years ago, the company I worked for at the time was “merged” with another company. (Actually, they bought us, but they went out of their way to say it was a merge, a partnership, blah blah, when it was quite the opposite.) I couldn’t help but think of the company that acquired my company as the Prince, and some of the tactics explained in Macchiavelli’s work definitely applied. They sent one of their own to reside in our office, to kind of “lord” over it, to quell any hostilities that arose. Slowly but surely they put down their tentacles until little remained of our old company. There was much resentment and talk of some of the managers splintering off and forming their own company, but nothing bubbled to the surface. Anyway, if politics ARE your thing, and you’re a little smarter than me, then you might enjoy this classic work. If you’re like me you might want to skip this one and if you’re really interested in the principles of Macchiavlli, read the Cliff Notes.